The story of the modern-day dai pai dong is a sad one, as yet another piece of Hong Kong’s rich heritage gradually disappears. The government stopped issuing “big licenses” long ago and the remaining green metal eateries are steadily closing as sons and daughters choose desk jobs over these traditional outdoor kitchens. 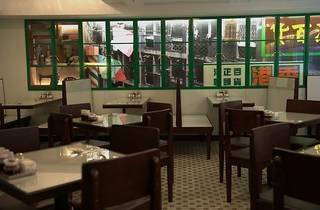 But suckers for nostalgia are embracing the old again, and at Hong Kong Dai Pai Dong the owners are having fun playing with old Hong Kong, making it new again – and this time with air-conditioning. There are two floors resembling two different styles of diners from yesteryear: salarymen slurp next to hipsters on fold-up tables on the airy top floor, while the ground floor houses the signature open kitchen, with a table for sharing just outside and a rickshaw parked next to it for good measure. The food is classic dai pai dong cuisine. 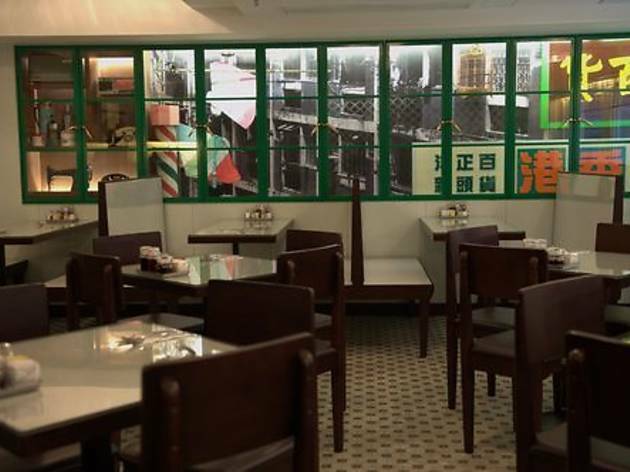 You see the post-WWII references in the “East Meets West” or “European touch” sections of the menu, with items such as E-fu noodles with prawn in tomato conasse, Hungarian beef with rice, chicken a la king and Italian-style oxtail. But the real gems are to be found in the traditional: braised eggplant with minced pork and salty fish, French toast, fried rice vermicelli with shrimp and pork, beef brisket curry and baked pork chop rice. But strangely, it’s the American-style breakfast and milk tea that truly represent dai pai dong culture. The American-style breakfast is one large plate containing smoked ham, sausage, Canadian bacon, hash brown, toast, and pancake with maple syrup ($49). This comes with freshly brewed coffee or milk tea. The milk tea ($15), orange in colour from black leaves and swirls of condensed milk, is so thick you could almost stand a spoon up in it. Another dish that wowed us was the meat pie – not in the English pub sense, but a humble plate of steamed minced pork ($38). Take it from someone whose default midweek recipe is this very dish: it’s simple to make, but very easy to mess up. One minute too long in the steamer and the whole thing tightens to a knot. This one might be the best steamed meat pie we’ve had in Hong Kong. And given that we arrived during a busy lunch hour, we were doubly impressed that it was cooked perfectly. A lot of this has to do with the fat content of the meat, higher than most others, but also the quality of the meat, which we reckon has never seen a freezer. The kale with salty fish in a sizzling hot pot ($30), meanwhile, retained its crunch while it took on the melted anchovy flavour. This dish intensified the longer it stayed in the pot. Wonderful. They also have a chef dedicated to taking care of the rice station, where each grain was unbroken and gave a perfect chew.